I hope for your sake that you’re nothing like me. If you are, you’ve probably saved every single glass jar that’s ever crossed your path. (Don’t even get me started on reusable plastic containers, which merit a whole separate post.) Once something lands in my apartment, it’s there for the duration. Someone once attempted to give me a smackdown for advising my favorite people in the world, my readers, to cover their cookie dough in plastic wrap. 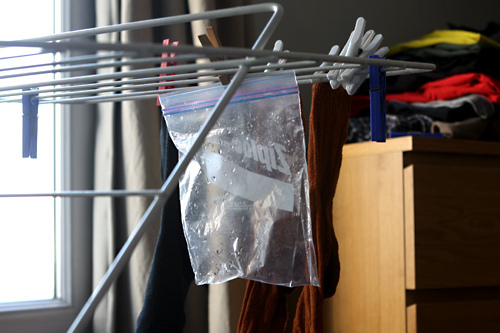 But little did she know that I’ve been using the same sheets of plastic wrap, and plastic bags, since my arrival in Paris many years ago, which I rinse and dry methodically. Believe me, if a plastic bag or jar ever exits my threshold, it’s destined for only one place, and that’s the Smithsonian. I have two areas in my apartment specifically dedicated to the preservation of glass jars. One is for jars I use for jams and jellies, and the other is for jars I’ve used for pickles, kimchi, and other things that are stinky. And nary the two shall meet: we all, somehow, have learned to co-exist in my tiny garret. I am an avid jam-maker and I always make jars and jars of jam with whatever fruit happens to be copious at the market. It’s a bit of a sickness and like my cabinet that’s a jumble of plastic containers, I’d need to increase the bandwidth here to let you know what’s going on in my refrigerator. When giving away my overload, I choose which jar goes to whom; if it’s a particularly pretty or interesting jar, it goes to someone I really like. If it’s a dinky jar, it’s for someone I don’t know all that well, but still want to give them a taste of the jam. 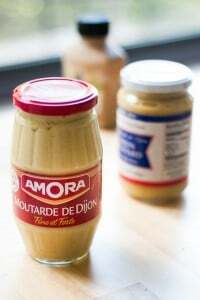 A lot of jars, especially in France, are pretty distinctive, French Dijon mustard jars come to mind. 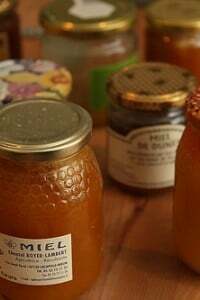 And in France, Bonne Maman jams and marmalade come in attractive ribbed jars with wide mouths which make them easy to refill with your own confiture du jour. Plus the labels come off easily after only a brief soaking. I often ride my bike down the Quai des Celestins since it has a bike path and is marginally safer than riding on the suicidal thoroughfare. It’s actually not all that safe as the Midas muffler shop regularly has cars double-parked and if you’re taking in the scenery and forget, and don’t swerve away quickly, you’ll likely to fly over the handlebars and plaster yourself on the side of a Citroën. There’s a great shop on the corner, agreeably called Cornershop Diffusion, and the brightly lit window filled with Danish flatware and other modernist goodies always makes me stop, gradually, to take a look. I keep hoping that my sleek—but somewhat unusable…at least according to my resident jam-eater, Arne Jacobsen flatware will one day be on sale, so I can add a few more pieces. Including that elusive—and pricey…bouillon spoon that I seem to be missing, that may, or may not, have gotten swiped. If you’re out there and have a single Georg Jensen bouillon spoon in your possession, and don’t get any jam from me, well, I hope you’re enjoying that spoon. One recent evening I was riding by and, as usual, I slowed down when passing their brightly illuminated window, looking for my flatware en promotion. Since I’m an optimist, hope springs eternal, but I haven’t seen it yet. Yet illuminated in the window were these graceful, charming jar tops. I gently squeezed the brakes, not wanting to risk of flying over the handlebars, because I knew that life again was worth living when I discovered yet another, and rather creative, use for my reusable jars. So the other day, I took a walk over there to get them. When the clerk showed me the box, I noted, rather incongruously, that there was quite a bit of packaging involved to wrap these five jar tops, which I presume was meant to be a ‘green’ gesture. There was a box, a cardboard slotted holder for the lids inside, plus two reinforced cardboard side holders, and each screw top was individually wrapped in plastic. And there was an instructions book. Raise your hand if you need instructions for screwing a lid on a jar. But since I was riding a bike, not driving, I figured I was neutralizing mon empreinte carbone so I bought them. What was funny was when after I paid, the clerk reached for a bag while I was simultaneously opening my reusable shopping tote, to take them home. “Il faut!” I said, (“It’s a must!”) and we both had a good laugh as he slid the box into my nylon sack. And now I’ve got five jars with new lids, and new lives. I am that person too! 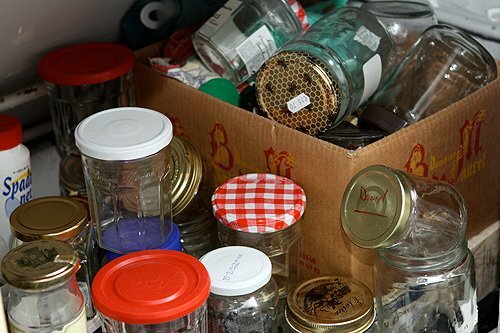 i actually spot some of the jars i have in your pile. 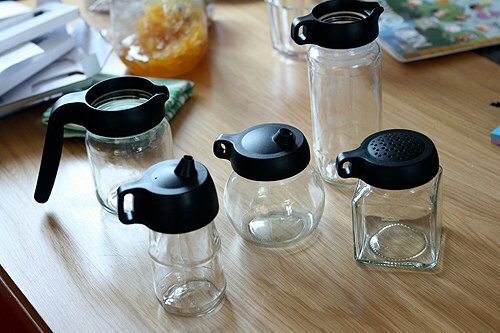 My family & I started getting into “saving” (collecting) glass and plastic containers from food purchases several months ago. Boy do they add up quickly! But it has been great knowing that I have so many little containers to store things in… I don’t need any plastic or disposable things in my house now. 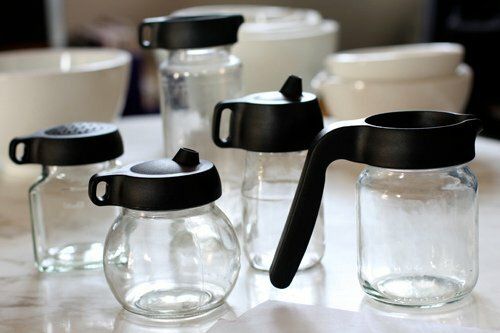 I love the idea of using those lids to make the life of your containers last even longer! How timely! After six years back in California, I am finally moving back to France. Last time I stayed in my boyfriend’s tiny flat in Strasbourg, jars of all shapes and sizes had taken over the 40 sq.ft. we were sharing. I am pretty eco-aware (I am a Cali-girl after all) but was driven mad by what seemed like dozens of boxes full of jars (and the absurd amount of disposable cups he also re-uses). Your find has given me new hope and optimism for the future that awaits my soon-to-be husband and myself. P.S. 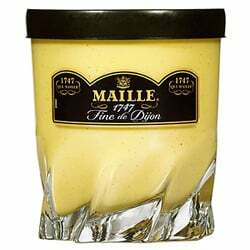 If you need me to drop off a “jar” of GooGone on my way to Strasbourg, just let me know! 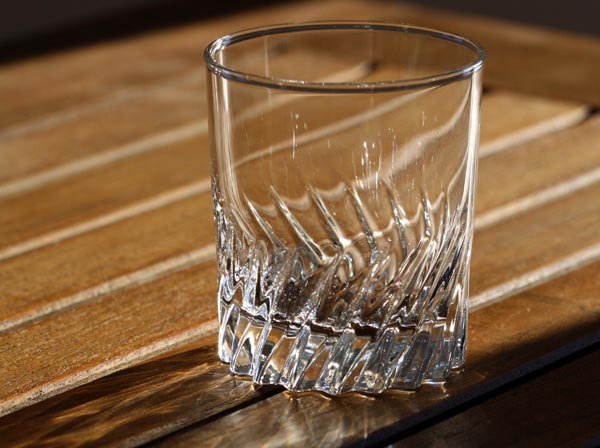 Once I arrived here in France, I noticed that everything in a verre jar, and this luxury don’t exist in my country, Indonesia. So, once I realize about this fact, I went crazy and keep all the empty jars.. I used it from keeping a conserve pickled cucumber to saving a cold expresso! I love jars, too. My drinking glass in the bathroom for the past 15 years has been a Nutella jar (small size). I don’t even know if Nutella is sold in glass jars any more. I just discovered your blog and love it. I want to come and live in it! I just stumbled across the jar-post and am simply enamored about how much love for detail is put into this enchanting piece of writing. I am deeply delighted that apparently there are after all some people who share my “spleens”! Thus I am sending my cordial graditude into the digital void! 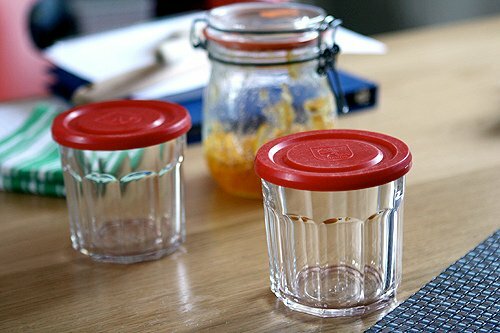 Just a question – can you make jam in a Bonne Maman jar, and use the original lid, or must you buy new lids? I thought with the whole canning sterilization and sealing thing, one should always use new lids? Susan: if you’re going to can and preserve something, through boiling water or another method, I believe you should use new seals. But I’d recommend checking with the USDA or Ball website (or another trusted source) on canning, to verify what’s recommended for safety. ha, ha, that’s a great post David. I found many similarities. I thought my mom and I are the only ones who reuse Ziploc bags. For glass jars, you can never really have enough. I am already out for this season of jam making and have to tell my friends to return the empty ones or they will not get new jams. Also in Germany there is no household who wouldn’t serve you a drink in an old mustard glass.